I went with Mommy's officemates at BOI during their outing at Bagac, Bataan last May 6. 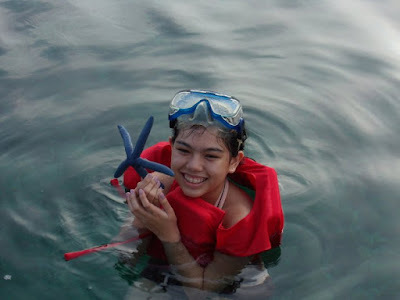 It was my first snorkeling experience and it really affirmed my love with the water. I was the only girl in the group that decided to snorkel (the rest just stayed at the beach) and several of the young boys in the group, who were the sons of mom's officemates, thought I was a high school junior! Imagine that. I think they still don't believe I'm turning twenty this year. They cried bluff when I told them so. I, of course, take that as a compliment. Ha! I got a hold of a blue starfish and it was beautiful - it was the first time I ever saw a starfish in its natural habitat. (No worries, I returned the starfish safely to its home.) This was me having a pretty Misty moment. I was almost tempted to challenge someone for the Cerulean City badge - almost. And I can't remember life before your name. Absence makes the heart grow indifferent. There are too many words in my head right now.